Sado (SAY-doe), despite being the smallest of the main islands, is capital of the empire. Over the centuries, Sado has been incessantly urbanized to accommodate the ever-growing city and Imperial Palace; at this point, almost all of Sado is covered with towering, elegant crystalline structures. The only undeveloped land still visible on the island is a small strip of sandy beach that runs along a third of the island. Centrally situated, Sado is next to Odaiba and within sight off all other islands save Kozu. From a distance, Sado looks like a complex gem, and its structures are oriented to catch the sun at all times of day and shine it back up into the sky, creating beautiful patterns against the clouds. Oki (OH-kee) is the most biologically diverse island in the archipelago, as close to a jungle as is possible in this climate, though severely lacking when compared to Mata Nui’s Le-Wahi jungle swamp or Ga-Wahi river delta. As most of the islands are deficient of animal life, this island is the largest remaining home to dozens of near-extinct plants and animals, the only other known specimens being in captivity in the gardens of the Imperial Palace. 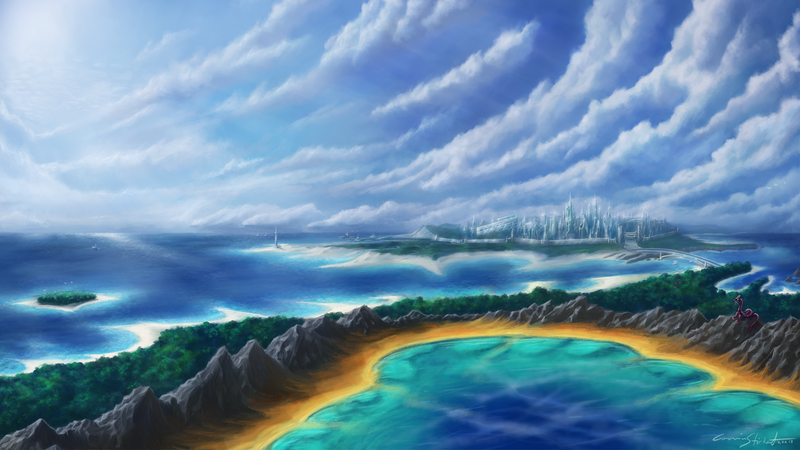 A thriving population of minor clans lives on Oki; they are generally ambivalent towards the politics of the empire, unless the sanctity of their island's natural beauty is brought into question. The Umbraline Clan hailed from Oki, and still carries weight in the island's day-to-day affairs. Odaiba (oh-day-BAH) is the largest of the five main islands, its landmass almost equivalent to the other four largest islands combined. Home to over a dozen minor clans, it is the breadbasket of the empire. Most of this island is involved in food production; fields, pastures and orchards sit on the island's gently rolling hills, dominating view and banishing most native flora and fauna. Odaiba's most interesting feature, however, is Mount Koshiki (Ko-SHE-kee), the largest and most intimidating mountain within the archipelago. 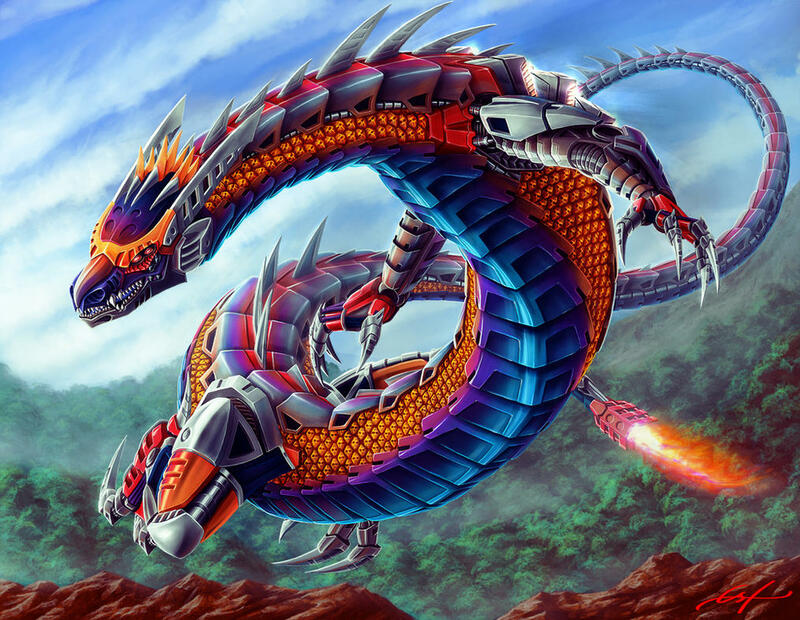 In antiquity it was an active volcano, but now it is an extinct mountaintop, home to one of the few native creatures that pose a threat to the Dasaka: the Kanohi Dragons. The crater atop Mount Koshiki is a poisonous, stagnant lake heated by geothermal gases. Iki (EYE-kee) is terribly devoid of plant and animal life, even by Dasaka standards. This little island makes up for its barrenness in wealth of natural resources, most importantly crystalline protodermis and other precious minerals. Ores and gems flow out of this mining island, shipped from its many docks to the Imperial Palace to be refined and crafted; these sea-lanes are the lifeblood of the Dasaka economy. Not surprisingly, Iki is the Datsana Clan’s home island, and it is from here they were able to launch themselves not only into the imperial economy, but into politics as well. Kozu (KO-zoo) is unique in two ways: it is the only island not directly visible from the Sado, and it is completely controlled by the Fursic Clan. What they do there half the time is a mystery, but until any concrete evidence shows up of misuse of trust, nobody minds Kozu much. Kozu is unremarkable in landscape; similar to Odaiba, it's mostly rolling hills and grasslands, with a small, token mountain - another dead volcanic development - at one corner. -The Imperial Residences: Located in the center ring of the Palace, this is where the imperial family lives, works, and presides. Spacious bedrooms, meeting halls, living quarters, and the Throne Room all are located within. Only high-ranking Dasaka are permitted entrance here. -Towers of Knowledge: The educational center of the empire. Home to the most prestigious of schools, the finest of museums, and the best libraries, these towers stand as the tallest pinnacles of the palace. Past, present, and future all collide here in unusual harmony; the silence of studying and research is at home next to the bustle of active discovery. The Dasaka's archives are also stored here, the annals of their entire cultural memory recorded within. -The Coliseum: The social center of the empire, it is here where all the major sports and other spectator events take place, everything from Paoro to gladiator combat to theatrical performances. There is always an event going on here, and considering the myriad of inns and eateries bordering it to accommodate the constant influx of Dasaka, it is the premier meeting and gathering place on Sado. -The Yards: Military stronghold and training facility. Here is where young Menti warriors go to be trained in the art of psionic and physical warfare. There are schools, training grounds, and instructors dedicated to each discipline stored within. In addition, the palace's docks are located nearby, so the Imperial Navy has its base of operation here as well. Besides the Imperial Residences, this is the most heavily guarded and fortified place in the entire empire. -The Wards: The massive apartment complex of the palace. Here is where most of the population of the palace lives and sleeps when not working, making it by far the largest section of the city. Most rooms are sparse if not comfortable, clean, and airy, and usually have two to three rooms, depending on the need. The wealthiest and most influential citizens occupy the penthouses on the top levels. Few Menti warriors live here, as their bunks are either in their barracks or other assigned areas per their duties. -The Markets: The economic center of the empire. Anything and everything is either produced here, sold here, or can be otherwise acquired here. More money and trade goods pass through this section of the empire than all the other islands combined, making the ideal place to do business. The upper classes prefer not to go here, as social order, stigma, and pride tend to keep them away from the lower castes. Still, one can find them here often enough, wandering the stalls on the hunt for special items (though the highest of Menti will usually send servants or couriers to do their business for them). -The Gardens: The massive park that takes up a large swath of the city. From a distance, the elegant layered gardens seem to hang in the air unsupported. A place of beauty and serenity, the gardens are valued therapeutically as places to seek peace and enlightenment. The rarest of plants, endangered species, and cultivating greenhouses spot this place; the gardens are proudly home to a large collection of flora and fauna that are extinct elsewhere on the archipelago. The gardens are sealed off to the lower castes; their values are reserved for the nobility of the empire. However, the healing centers below it are, by necessity, available to any needing assistance. Edited by Nuju Metru, Jan 05 2015 - 06:36 PM. The Dasaka are the BZPRPG's Toa, Turaga, and Matoran of Psionics. 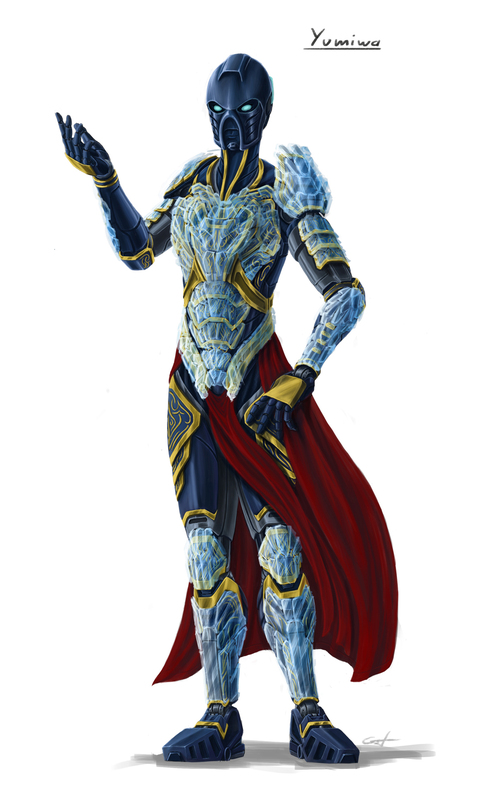 They come from the Kentoku Archipelago, and as such their society and culture are very different from those of the Toa of Mata Nui. Below you'll find all you need to know about Dasaka history, culture, powers, and more. Dasaka (DAH-suh-kah): the species equivalent of Toa, but also an umbrella name for the species as a whole. Dasaka individuals can be learned in up to four disciplines of the mind depending upon rank and experience. Dashi (DAH-shee): the species equivalent of Matoran, but also the name for the working class and the title for those in that class. Dastana (Dah-STAH-nah): a relatively new clan that is a conglomeration of merchants and businesspeople. Datsue (DAHT-soo-ay): the species equivalent of Turaga. These are revered elders who exist outside the social hierarchy. Generally retain some of the disciplines of the mind. Fursic (FURR-sick): an old and powerful clan with a history of insubordination. Kentoku (ken-TOE-koo): the archipelago of islands on which Dasaka society lives. Menti (MEN-tee): the warrior class, and the title for those in that class; descriptor for a being trained in one or more psionic disciplines. Ringti (RING-tee): the artisan class, and the title those in that class. Rora (ROE-rah): the empress of the Kentoku Archipelago; almost always a Datsue individual. The next in line to be Rora is known as the Chojo (SHOW-joe). Saihoko (seye-HO-koh): the merchant and nautical class, and the title those in that class. Can be abbreviated to "Hoko," an offensive term. Toroshu (toh-roh-SHOO): a member of the nobility with command over a clan. Second only to the Rora in terms of authority, though oftentimes the military clout of a Toroshu will be stronger than that of the Rora. Toroshu are usually Dasaka individuals. Umbraline (UMM-brah-lean): an ancient clan currently in charge of the Dasaka Empire. Civilization on the Kentoku Archipelago is a highly regulated matriarchal machine. From the Rora, the empress, down to the lowliest Saihoko fisherwoman, every Dasaka knows her place and her duty within the machine. Law is strict, but usually benevolent. Tradition and respect are highly valued. Society on the Archipelago is defined by bloodlines, which supersede almost everything else. Dasaka owe loyalty to their families, and as such society is divided into interrelated clans – made up of one or more families, each led by a female Toroshu – all vying for power. Blood bonds, courtship, and fleeting alliances define the political game among the notable clans, a game that is played beneath the watchful eye of the Rora. In the ancient past, though, the Archipelago was without a presiding empress. The Dasaka clans of ages ago were like prides of lions: wild, and led by warring males. Impulsive, quick to anger, and with little regard for the lives of their female soldiers, the warlords battled over everything from lands to mere swords. Though the warlords were strong - their mental powers were unconstrained by the modern disciplines - their haughty pride blinded them to the growing discontent of their subjects. Unified by the First Mother (who, legend has it, was in fact the Great Spirit Zuto Nui, descended from the sky) the Datsue elders of all the clans of Kentoku met in secret and arranged the overthrow of the males. There followed a revolution, and the first sovereign Council of Datsue assumed power. For a good while, a Datsue Council presided over all the clans. The peace that endured under the rule of the Datsue was uneasy, though; bad blood between the clans still ran deep, and the lieutenants of the old warlords were not without ambition. Using the Datsue's frailty, scholarly tendencies, and military impotence against them, these lieutenants turned the opinion of their clans against the Datsue Council, and cooperatively staged a coup. Thus, the first Toroshu came to power. Though they had scorned the Datsue's leadership, the Toroshu kept in place many of the Datsue Council's innovations that benefited them, including the subjugation of males, and the separation of the Menti Disciplines. It wasn't long before the Kentoku Archipelago was again split by war. The War of the Sea (so named because it was bottomless) was waged across generations, and many honorable clans perished in the struggle. When peace was finally reached, the remaining Toroshu decided to elect an empress, one who could act as arbiter for their future disputes and prevent such a war from ever happening again. The impartial matriarch of Clan Umbraline, seen by most of the Toroshu as wise and calm, was chosen; the ambitious Toroshu of Clan Fursic, whose armies had won the war, never forgave the insult to her family. The rule of the Umbralines has continued ever since. Punctuated here and there by Fursic uprisings and attempted coups, and the occasional inter-clan war, the age of the Rora has been one of prosperity upon the Kentoku Archipelago. Order – Always respect your place on the social ladder, in the family, and in the clan. Never go against the caste system or cause entropy in society. Power – Strive to be better than you are, stronger than you are; become as powerful and resilient you can become. Always act to improve yourself and your clan. Honor – Make your actions reflect positively on your clan and your fellow Dasaka. Give elders, betters, and teachers the respect that they are due. Be humble, be courteous, and be courageous. When it comes to loyalties in Kentoku society, family ties are superseded only by the Archipelago’s long-standing caste system. There are four castes in Kentoku society: Menti, Dashi, Ringti, and Saihoko. The warrior caste of society, and the highest tier. While this entire caste is generally referred to as “Menti”, within this caste there are three further ranks: Rora, Toroshu, and Menti Warrior. At the very top of the Kentoku hierarchy is the Empress, the Rora. While the Rora retains unassailable authority in name and prestige, she has little actual military power, that resting chiefly in the Toroshu below her. 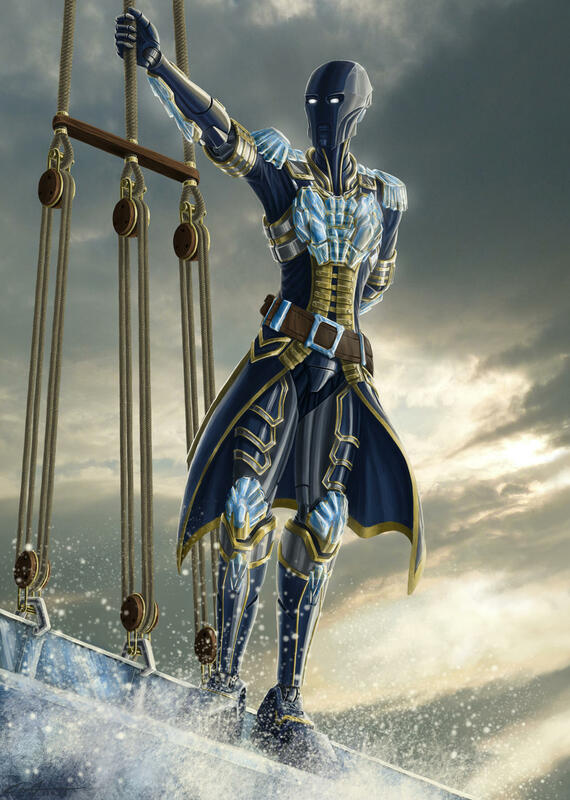 In essence, the Rora is a figurehead of the Dasaka species, not its true leader. Nevertheless, what the Rora says carries much weight, as she can bestow punishments or rewards upon anyone she wishes. The Rora acts as an arbiter of inter-clan disputes. Immediately below the Rora in terms of political power are the Toroshu. They are the generals and the diplomatic heads of their respective clans. In practically everything, especially in war, Toroshu hold absolute power, as all Menti warriors are instructed to obey their Toroshu before all else. Under a Toroshu is generally a web of nobility and lieutenants. Menti warriors, the soldiers and guards of the empire, answer directly to their Toroshu both in peace and wartime. Menti warriors are trained in particular disciplines of combat to become deadly soldiers, the muscle of a Toroshu's power. A handful of Menti warriors serve the Rora directly as peacekeepers and guards on Sado. The second tier of society, the Dashi class is comprised of farmers and other manual laborers. Great value is given to those who work, so the simple farmer and peasant are the next-highest rank after the warriors and nobility. According to Kentoku ideals and work ethic, farmers are superior to artisans and merchants because they produce the food that all the other classes depended upon. The Dashi also make up the majority of the population, and therefore represent the near entirety of the workforce and taxable income. The lives of Dashi are simple and safe; it’s seen as extremely dishonorable (and impractical) to slay a Dashi. Third tier of society, the Ringti class is made up of skilled workers. Although artisans produce many beautiful and necessary goods, such as clothes, cooking utensils, weapons, etc, they are considered less important than the farmers. Even skilled weapon makers and boat wrights belong to this third tier of society on the archipelago. The artisan class lived in its own section of the major cities, segregated from the Menti (who usually lived in the Toroshu's castles), and from the lower merchant class. They usually live comfortably, as imperial quotas and tariffs regulate the supply and demand for goods, and a profit is almost always turned. The Dasaka individuals in the Ringti class are usually crystal smiths, who use their abilities as Mindarms and Soulswords to craft fine crystal objects, such as buildings and weapons. There is a specialized school in Sado that trains crystal smiths to apply Menti powers to delicate tasks. Ringti inventors are treated with fickleness by society. 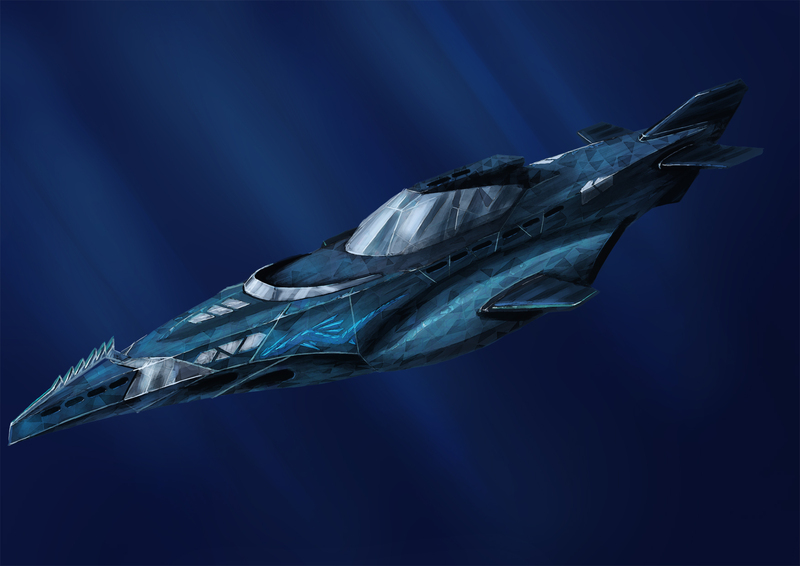 The Menti leaders are generally adverse to technological advancement, as it goes against tradition, but some of the more shrewd ones are willing to disregard this pride if a truly useful invention, such as the submersible, is created. Ringti generally have thick skin against critics, and so will celebrate these victories rather than wallow in their rejections. Merchants occupy the bottom rung of the Dasaka’s feudal society: traveling traders, shopkeepers, and even sailors are placed here. Merchants are ostracized as "parasites" that profit from the labor of the more productive peasant and artisan classes, and despite their essential role in society, most other Dasaka revile them. Not only do merchants live in a separate section of each city; the higher classes are generally forbidden to mix with them, unless on business. Nonetheless, many merchant families are able to amass large fortunes through their hard work and business sense, and force their ways into higher castes. It is common to insult someone by calling them a “Saihoko”, or even “Hoko” for short, representing the lowest of the low. The Dasaka species equivalent to the Turaga exist as a general rule outside the caste system, having lived a long time and now retired from their previous careers to become respected advisers and holy women. Their elder status earns them freedom within the Archipelago, and they are free to pursue whatever they wish. While they are an integral part of the traditional Kentoku hierarchy, Datsue are simultaneously above and separate from it. They are the keepers of the history and knowledge on the archipelago, and the ones that perform the spiritual and symbolic ceremonies important to the Dasaka. The Datsue serve those who seek understanding and counsel. They help prepare new Menti for their training and give sage counsel to the young as well as the old. In times of great crisis, it is the Datsue who act as judge and jury, ferreting out the dishonorable and administering justice according to the ancient laws. Most Toroshu work in tandem with a Datsue, relying on the elders as advisers. Because of the imbalanced gender ratio on the Kentoku Archipelago, males are rare; as such, they are highly prized within society as both reproducers and aggressive warriors. After a male is born, the Toroshu of his clan isolates him at a young age, sending him to Sado to be trained as a fierce Menti warrior. After extensive training – males are almost always taught in two disciplines of the mind – they are generally assigned as companions or bodyguards to high-ranking females. Only familial First Sons, the eldest males of prominent clans, escape such duties. Ironically, males have virtually no rights save those defined within their specialized role in society; male Dasaka are, due to their value, perhaps the most completely controlled by the caste system. The birth of a male in a family can instantly gain that family status; conversely, the death of a male prior to his apprenticeship will cast a family into the deepest shame. Most females will never have offspring, this task being either regulated to those higher in the caste system or saved as rare gifts for acts of service or bravery. To mate and bear offspring with a male is considered a great honor. Menti warriors fight using different psionic powers. 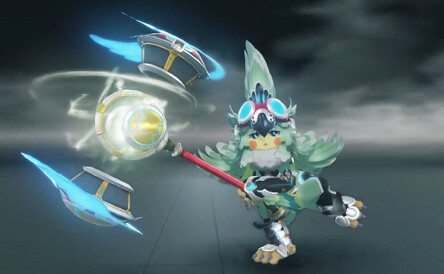 To limit their warriors' strength as individuals (advancing the virtue of Order) and to turn their Menti warriors into specific tactical weapons, the ancient council of Datsue split Menti training long ago into several different disciplines. The discipline or disciplines a Dasaka will study depends upon her pre-existing affinities and aptitudes – tested at the beginning of her training – and on her rank in society. While no discipline is inherently better the next, students of each tend to believe their practice is the superior one.The higher on the ladder of power one ascends, the more schools are open to be learned. All Menti are trained in at least one school. With more experience and military rank, it is possible for Menti to attain a second discipline. Powerful, exceedingly rare Menti known as Battlemasters are proficient with three; only the heroes of legend were rumored to have been able to use all four psionic powers. The disciplines are as follows: Soulswords, Sighteyes, Mindarms, and Willhammers. Allows the user to harness psionic energy and, to an extent, use it in the physical world. A rudimentary and less precise Soulsword ability is to take psionic energy and whip it at foes, most often as a blunt attack. Fully experienced Soulswords, however, can form and mold the same raw psionic energy into a physical weapon, breaking the barrier between mental and physical attacks. The psychophysical weapon produced is made of shimmering, dripping and solid energy, and it can be used in lieu of a normal physical weapon. Soulsword students, however, must choose only one weapon shape to study, as an incredible familiarity with that weapon is essential to its effective use. Soulswords may only summon ONE psychophysical weapon at a time. Weakness of the Discipline: Soulswords’ training in recognizing and resisting other disciplines of the mind – the illusions of Sighteyes and the influence of Willhammers – is minimal, as most of their time is devoted to the rigorous endurance conditioning necessary to maintaining their weapons in extended combat. 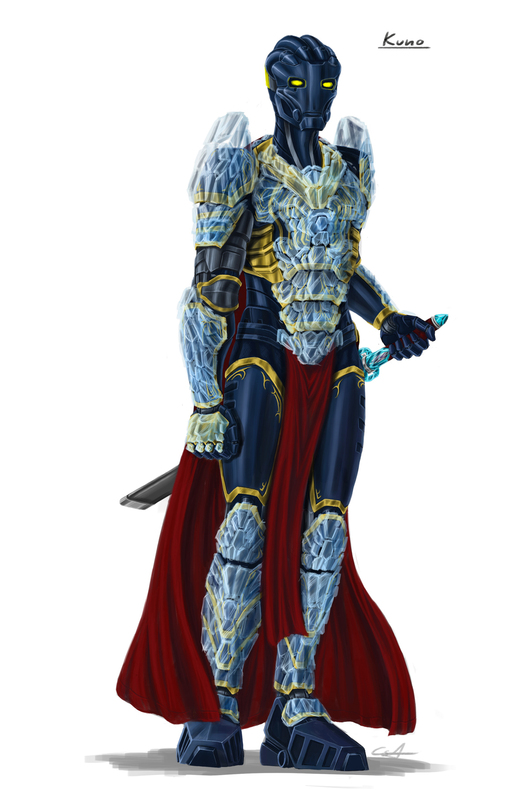 Soulswords are also rarely aware of the line between their reserves of physical and elemental energy in the heat of battle. Allows the practitioner to create and maintain illusions that can fool all five senses. Sighteyes can make their enemies believe anything they wish by overriding the sensory receivers of that enemy's mind and replacing those feeds of information with fictional information. A Sighteye's illusions are utterly convincing when maintained properly, so much that they can fool the deceived into believing almost anything. A highly trained Sighteye can make themselves basically invisible by replacing their appearance, scent, sound, and etc. with other sensory perceptions. A Sighteye, however, cannot fully eliminate an enemy's senses, only change what they are sensing. Sighteyes can target multiple minds at once, though the more sets of senses they are fooling, the more energy it will take them to do so successfully. Weakness of the Discipline: Sighteyes, when performing convincing illusions, cannot move. To leave the mental plane long enough to even, say, take a step, would immediately break the Sighteye's projected deceptions. Allows the practitioner to moving objects by mental force. This schools trains in the art of manipulating physical objects with the mind, and Mindarms are able to lift, push, pull, shove, or throw objects using only their mental prowess. Simple actions, such as throwing objects in battle, are very basic and take little concentration for a Mindarm. More delicate or complex motions, however, require more finesse and focus to be done correctly. Objects in motion, such as projectiles, also take far greater skill to manipulate than static ones. The larger an object that a Mindarm is trying to influence is, the more rapidly it will tire them to move. Limited levitation is possible to advanced Mindarms, who have the ability to lift and toss themselves in a controlled manner. Weakness of the Discipline: Mindarms have the most physically strenuous Menti discipline, since they are often involved in other bodily action at the same time as they are wielding their powers. As such, they tend to burn out relatively quickly. Allows the practitioner to see into, enter into, and interact with the minds of other beings. A Willhammer can thus press their will upon others through honeyed thoughts, sheer force, or other forms of mental deception. Willhammers can project emotions, words, images, and subliminal thoughts into their minds of choice, and are as such the only Menti able to converse telepathically with non-Menti (such a conversation occurring inside the mind of the subject). Since Willhammers can more or less see what the subject of their power is thinking, they generally understand the best way to convince others to follow their will on a case-by-case basis. Willhammers can only affect one being at a time. Mental entry is, in its nature, a one-sided negotiation of wills; as such, it does not work automatically. Its power can be resisted if the entered mind has an abnormally strong will or sense of self. Weakness of the Discipline: Willhammers, unless extraordinarily skilled, are hardly ever able to convince their enemies to do exactly what they seek, even if their intended puppet has submitted to the Willhammer's wishes. Their discipline also requires much concentration, and as such restricts most bodily movement. A minor discipline that allows the practitioner to communicate with other Menti. It is the first skill taught to every Dasaka during their training; as such, all proficient Menti have the ability to "speak" with one another via thought. Telepathic communication basically works like a radio: an individual will project the words/images they wish to communicate onto the mental plane, where others can selectively pick up the “transmission” with mental plane access. 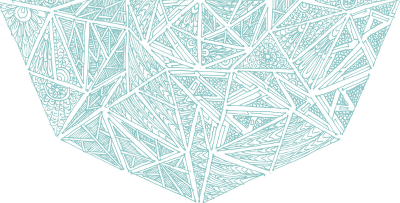 Every Menti (indeed, every sapient being) has a different "feel" on the mental plane; this is how when multiple Menti are communicating at once, they can distinguish different streams of consciousness from one another, or sense approaching beings on the mental plane. Telepathy grows more difficult and less accurate as distance increases. While there are dozens of families and clans that inhabit the Kentoku Archipelago, three stand taller than the rest: Clan Umbraline, Clan Fursic, and Clan Dastana. It is these three monolith clans that carry the most political clout, and the actions they take affect all other families in the Empire. Most minor clans loosely ally themselves to whichever of the three leading clans best represents their interests. The Umbralines can trace their history, ancestry, and bloodline back to the creation of the Empire, and have held power for a long time. They are staunch defenders of the old ways, a voice arguing for conservative stability in an otherwise tumultuous political scene. Despite making up a minority (albeit a large one) of the Dasaka population, the Umbralines are unquestioningly the most influential of the clans; the current Rora, Yusanora, was the Umbraline family’s matriarch before her ascension, and although her current position separates her from the management of her clan, her favor is still felt. The Umbralines contribute a majority of the Willhammers to the Menti ranks (as this is their clan discipline). While not always adverse to change, the Umbralines are highly conservative, more willing to rely on tried-and-true customs and technology than new inventions and ideas. Umbralines tend to be the diplomats and mediators of the empire. The Fursics are an old clan with a long history and an even longer list of grievances. Their family has had a grudge against the Umbralines for as long as anyone can remember; they’re resentful of the Umbralines’ power, and frustrated after several failed coups – attempted in the past – by members of their family (which more astute Fursics always try to distance themselves from, calling such acts of infidelity to the Rora “ancient history”). Though less populous than the Umbralines, the Fursics have twice as much land at their disposal, which is ironic since they do not have the numbers to properly care for and defend such vast territory. The Fursics provide to the Empire with many Sighteyes, as this is their clan discipline. Many Dasaka outside the family are convinced that it is through deception and cheating that the Fursics have come to amass and cling to such power within the Empire, even despite their notoriety. Fursics tend to be the informants and spies of the empire. One of the youngest Clans to come to power, and one of the most unusual, the Dastana Clan are more of a confederacy than one single family. Originally a group of Saihoko, this family became so wealthy and powerful through their shrewd mercantile business and inventions (notably among these, the submersible) that over time they gained enough influence to buy their way into the upper clans. This above all else is the reason that other clans universally despise the Dastana. Nevertheless, there are few that would dare touch them: the Dastana hold the purse strings of the empire. They are neither the most populous nor militarily strong of the clans, but they control the merchant and artisan castes, and therefore hold the majority of the money in the Empire, forcing everyone to put up with them. The Fursics despise the Dastana, while the Umbraline remain cool, if not friendly, with them. The Dastana have, over the last few centuries, provided many Mindarms – their clan discipline – to the Empire, cleverly mated into influential families, and performed acts of political subterfuge (to rival even those of the Fursics) on their road to power. The Dastana tend to be the merchants, artisans, inventors, and moneychangers of the empire. Vezok's Friend has done several artworks of the Kentoku Archipelago and its denizens, which should serve as good indicators as to the general nature of appearances in Dasaka society. Dasaka are all various hues and balances of blue and gold. How blue vs. how gold they are, what hues they are, and that sort of thing does not denote/align with caste. The visual way castes are distinguished is by their apparel; where high-ranking Menti will wear rich fabrics and intricate crystal armor - ceremonial garments - Saihoko generally clothe themselves in pragmatic water/windproof ponchos and the like. Colors worn by Menti are usually those of their clan. Almost all cloth Kuno owns, for instance, is dominantly red, because that's the Fursic color. The Umbraline color is officially purple, and the Dastana wear various tints of yellow. Minor clans usually have to settle for two-color schemes in their regalia, since single colors have almost all been taken by older and more powerful ones. 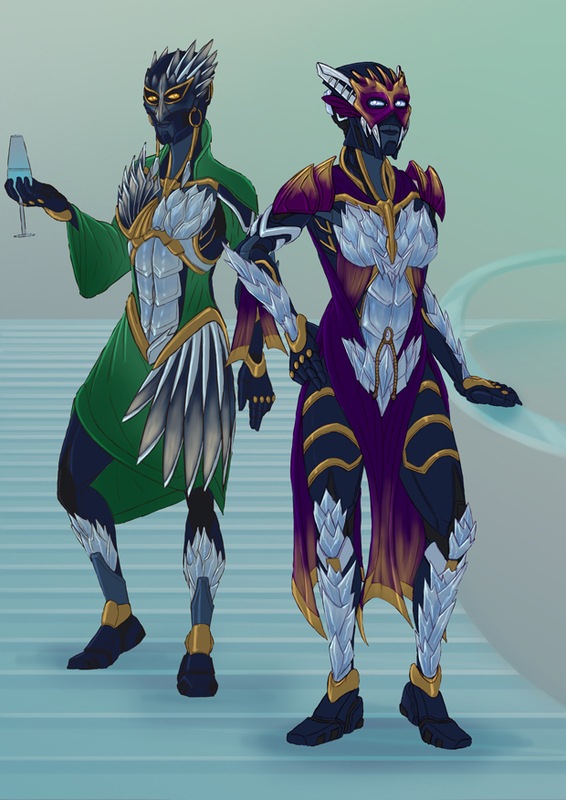 The Rora and her family can wear whatever colors they wish, to reinforce the idea that they are separate from and above clan politics. White: light, age, honor, sky, wisdom, discipline, Zuto Nui. This color is seen as female. Black: darkness, youth, power, sea, beauty, strength, Zataka. This color is seen as male. Unaccented white and black garments are traditionally only worn by their respective genders, and only worn for occasions of great ceremony such as the passage of power, the union of two individuals, or the eulogy of one who has died. Edited by Nuju Metru, Nov 30 2015 - 05:44 PM. It was with as brisk a pace as she could manage that she followed after Sanei. Sanei knew that her armor slowed down her motions somewhat, but she didn't even seem to think it worth remembering, instead deciding to complain abut her being slower. This armor was the reason she had been hired, because she looked downright terrifying, but no, Sanei wanted both speed and strength at the same time while paying as little as she could. Despite this, Eshai wasn't going to complain. She was not part of any clan, hers having broken up long enough ago that no one would probably ever care to remember its name. She held no political power of any kind, all that remained was her fighting skills. The very fact that someone of a caste as high as Sanei's would even think of hiring her as a body guard was nearly unbelievable. Within the blink of an eye, she was standing right beside her employer, her mask having carried her the distance in a single moment. As soon as she appeared, she quickly fell into line behind Sanei once more. Edited by Cadias, Nov 09 2013 - 08:41 PM. Her response to the question on Sado was a nod. There really wasn't mush to say on the matter, as she couldn't care less. There was nothing beautiful left on the islands in her opinion, everything had been covered in an overwhelming field of apathetic grey that blocked out any sense of beauty the world might have once had. There had never been a place as nice as her own home, as small as it had been. But saying so to Sanei would be a terrible idea. "My clan is from -" She was stopped as Sanei's fickle attention switched away from bringing up things that Eshai did not wish to share. It was a relief to be sent to see who was on the hill, it meant getting a few moments away from Sanei's constantly insulting attitude, no matter how much it was deserved. Within a moment, she stood before Sato, her savage mask with an ever present and very sinister grin. "Who is it that waves at Sanei of Clan Umbraline?" The sound of crystal being slowly chiseled into a monument of the present. Nasang had always enjoyed her duty. She couldn't imagine life as a warrior, nor as a parasitical merchant. Life as one of the rulers was unimaginable. So Nasang paid those thoughts no attention. She merely chiseled away, her Kanohi combined with her Mindarm Menti allowing her to make accurate marks that fulfilled the vision she had been given for the sculpture with absolute precision. She had been requested to create a sculpture in commemoration for the creation of a new building, and Nasang complied. As she neared what she decided would be a 'half-way point', Nasang returned the tools she had been using to the table, and sat down on a rest bench she had prepared beforehand. Nasang had the constitution of the average member of her species, and using both her Kanohi, and Menti wore her out quite quickly. With a sigh, Nasang relaxed on the bench, trying to catch a hold of her breath, and wipe away the perspiration that she was secreting. She might have felt incredibly tired, but it was the good sort of tired. The kind that you got doing the things you enjoyed. OOC: Nasang open to interact. With a nod of response, Eshai vanished back down the hill. It stung, being used as a messenger for such short a distance. Once she had been a great warrior, she would have killed someone for expecting so pathetic a task to be done by her. But what choice did she have? It was do as she was told, or find herself another job, probably something far worse than being the errand runner for a spoiled Sanei. When she appeared alt the bottom of the hill, she noticed that Sanei had already walked up. Why then, had she felt the need to send her up in the first place? As she once again appeared beside Sanei, there was a dark frown hidden under the smiling mask. Edited by Ora_unit_SR388, Nov 09 2013 - 09:17 PM. Eshai remained silent, as the conversation held no connection to her. She had no right to speak during such without being asked, as much as she might wish to. She was here to be silent, to be terrifying, and to be a guard. Judging by the look on Sato's face when he had seen her, she was currently failing at the second. Then another person decided to join in, without even so much as an introduction. It was as though they had no sense of manners. She turned her savage visage towards the person, a cold glare staring out from her eyes. The person would have to wait. Then Sanei acknowledged them perfectly calmly, and she stood down. She was still quite wary of this newcomer, just as much as of Sato. Edited by Nocturne Auteur, Nov 09 2013 - 09:16 PM. Edited by Ora_unit_SR388, Nov 09 2013 - 09:29 PM. She could not have cared less about the relations of Clan Umbraline, for it really didn't concern her who was cousins with who. In fact, she found it extremely boring. It was like listening to the family tree of someone you didn't know read aloud. But complaining was something she could not bring herself to do. She hated this job so very much. Edited by Ora_unit_SR388, Nov 09 2013 - 09:36 PM. Edited by The Otter, Nov 09 2013 - 09:44 PM. Sato had decided to speak to her, calling her Menti. Just hearing herself called that again gave her a surge of memory, though she knew it would fracture apart as soon as the truth can out. But speaking in such a conversation was not her place. But, she had been spoke to first. It would be terribly rude not to respond. There was a weak smile behind her mask as she spoke. "I am Eshai, the warrior known as The Demoness, and I am no Menti." There was a pause before her response, as the situation of her own existence was nearly overwhelming. She was not of any clan, she wasn't of any caste. To describe what she was would be something almost impossible, but slowly an explanation came into her mind. "I was once a Menti, but my clan is no longer. I am now without clan, I am without caste, I am nothing." He family now held no power at all, if there was any left of it beside herself. How could one so closely related to the royalty of the Umbraline see that as merely a single misfortune? Perhaps it was merely her own inexperience with being thrown down without anything standing to stop the fall that lead her to speak in such an optimistic way about Eshai's situation. But that was not a common belief, most had viewed her with disdain, sometimes considered her to be below even Saihoku. One whos clan was inexistent could not hold power, nor even hope to claim the title of Menti. And even if she had, who would wish to claim an Menti from a clan outside of their own? No, despite the beliefs of Sato, there was no honor left in being the last warrior of a clan no longer alive. "My clan is not merely fractured, I am the last member surviving that I am aware of. To be without clan is to be without caste. There is no honor left for me." Edited by Ora_unit_SR388, Nov 09 2013 - 11:03 PM. Edited by The Otter, Nov 09 2013 - 11:14 PM. She thought for a moment upon the name, and like Sanei, she too came to the realization that the title seemed familiar. When one was outside of the culture, the names of others also outside seemed to stand out. But it had been a long time since she had found another that suffered from the same horrible reputation as she did. There was truly no honor in being a masterless warrior. Then Sato had spoken up, this time in a voice far different from the one that had been used to present honor that was undeserved. It was one with laced with threat. Eshai found she quite licked the previous way of speaking better. OOC: That would be the group with everyone in it. Edited by Ora_unit_SR388, Nov 09 2013 - 11:47 PM. OOC: I spoke to Nuju about this for creating this character and I just thought I should point out that the only people outside of clans and castes that still have a good reputation are the Datsue. The situation was beginning to grow tense, and as she had seen Senai's had rest itself on her sword, she had reached for her own Kanabo in preparation for whatever may occur. She was almost certain that with her mask and strength, she might be able to end a fight before either her or Senai had gotten hurt, but she really didn't want to test her luck. The arrival of another person broke the tension very quickly, though she certainly didn't like the tone used by Vatrica right afterwards. She didn't move her hand away from her weapon, as that was the main part of her job. She was here to protect Senai, and that wasn't something that she was going to let slip by. If the new arrival, or those already there, decided to try to pull anything, they best be ready for a fierce fight. It was only the departure of Sato that caused her to slightly lower her guard. The only person who had called her a Menti since the fall of her clan was now leaving the area without so much as a departing word. She didn't need to say a thing for Eshai to feel a sinking feeling of guilt in the pit of her stomach, as if it where soley her own actions that had driven her away.